I did not feel like this spring in my 464 was too tight. As a matter of fact I was amazed at how light I thought it was the first time I stripped the gun down to clean it. I'm a new member but I joined this forum to get some help with my newly aquired 30-30 464. Unfortunately I was experiencing a lot of issues that other 464 owners are well aware of, such as the feeding issue and now a little bit of the tube mag jamming. But good news for myself and other owners that have been dealing with the feeding issues. I was able to pin point where the cartridge was getting stuck in the action. I have pointed out in the picture of my action where I noticed that the cartridge was getting stuck. When the bolt is closing and trying to slide the case up that little ramp, the angle of the ramp and sharpness of the ridges cause the case to push into that part of the action and get stuck. What I did was i used a file to take the sharp edge off and round it at the top a bit so that it was like a little ramp for the base of the case. It's still not 100% yet but it's about 95% better. 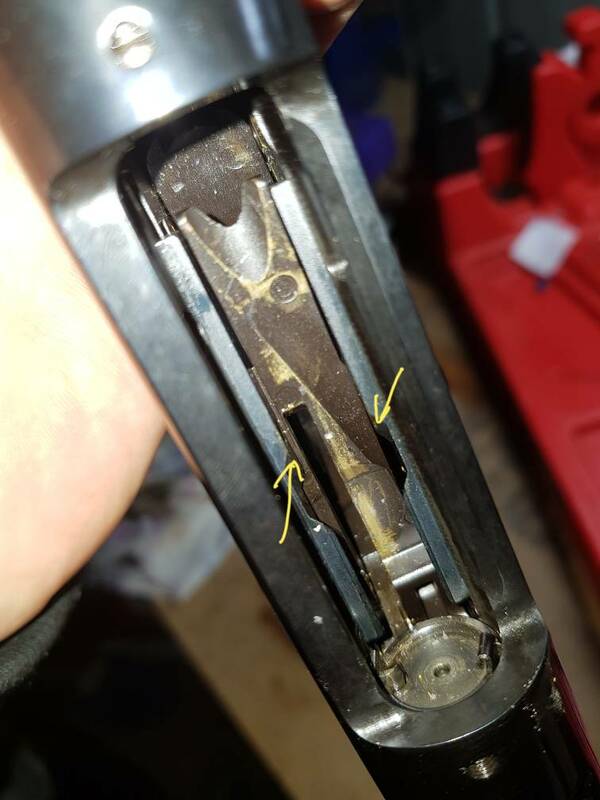 Before I did anything a case would get jammed every 2nd or 3rd cycle of the lever, afterwards I was able to cycle through 5 full magazines without a single jam. I did get a couple of small hang ups with my reloaded ammo but nothing like I was before. I can try and take some better pictures if people are interested. meanstreak, CaddmannQ and sullivan like this. Not sure if this is a problem or not, but after feeding some cartridges through my gun, I noticed the base is all dinged up. Should I worry or no? This gun is not brand new, though it hasn't had many rounds through it, if the previous owner is to be believed. Attaching a picture of one of the cartridges. Note that all I did was put this in the magazine, fed from there into the chamber and then ejected it without firing - my wife gets grumpy about shooting guns inside the house. 1. I sent Mossberg customer service this question a minute ago, along with the picture. I'll let y'all know what they say. 2. They got right back to me... and asked for the serial number, lol. Sent them that to move forward. I think that is from where I have pointed out in my post, I had the same marks on some of my cases and I noticed that the cases were digging into the edges on those little ramp pieces. Might be worth a look when you cycle it. This looks like s great tip. I will look into this on my .30-30 when I can get it back out. Definitely going to take a look at this! I also rounded the edge of the ejector hook, as that seemed to be a hangup place. WOndering if I combine the two if I might be able to get this thing close to 100%! I had failure to feed problems with every kind of ammo. Is that what is happening with yours? The plastic magazine follower needed polishing and the tube had to be cleaned. Worked well after that but be careful with the follower. Being plastic, it isn't all that robust. Metal followers are available in the U. S. A.
coolhandluke22 and meanstreak like this. Hope you get that straightened out Coolhand. Welcome to the forum from Oklahoma. coolhandluke22 and Elbert Garrett like this. Welcome to the group 1st Cav! Thanks...I'll take a look at this. 'Preciate the input.